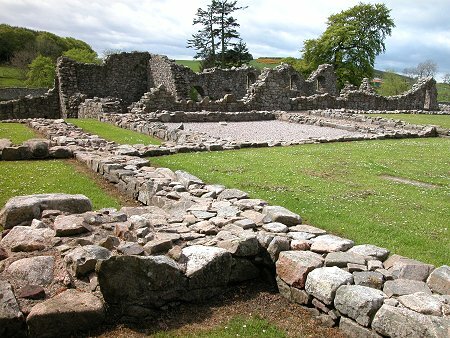 Deer Abbey was founded in 1219 by William Comyn, the Earl of Buchan, who invited the Cistercians at Kinloss Abbey in Moray to set up a daughter house here. 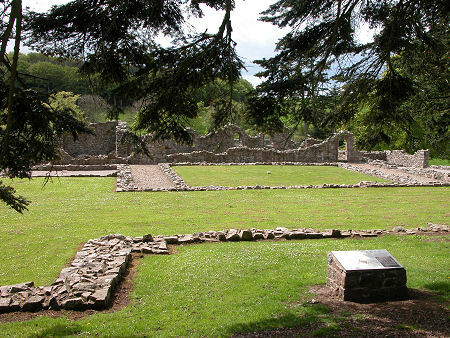 Comyn chose to found Deer Abbey here because of the strong religious traditions of the area: a monastery had been established in the 580s on a nearby site in what is now Old Deer by St Drostan, a follower of St Columba. 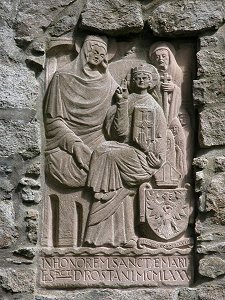 Deer's main religious claim to fame actually dates from the earlier monastery rather than the abbey whose remains you see today. It was here that the Book of Deer (or Deir) was written some time in the 900s, with later additions in Gaelic describing the foundation of the original monastery. It thus contains the earliest written Scottish Gaelic yet discovered. The Book of Deer is now in the Cambridge University Library. Deer Abbey was always a small community, with never more than 15 monks at any one time. The abbey church was cruciform in shape, some 157ft long with an aisle on the north side of the nave. Today nothing remains of the church above a course or two of stonework indicating its outline. 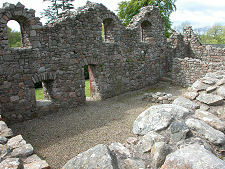 Better preserved are some of the buildings to the south of the cloister. The abbot's house, refectory and kitchen all survive sufficiently to give some idea of what they might have been like, though all floors and ceilings, including some that were obviously vaulted, have long gone. Like the abbey church, most of the buildings to the west and north of the cloister are nothing more than lines of stone in the grass. 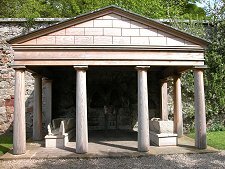 To the north of the remains themselves is an odd wooden construction of a portico and Doric columns (echoing the grand gateway you entered by). This provides shelter for a display of carved structural stonework found during work on the abbey. Nearby are a line of grand yew trees that look as if they might well have stood watch over much of the abbey's active life as well as its subsequent decline and fall. Like other Scottish abbeys, Deer's useful life came to an end with the Reformation in 1560. And in common with many, it then became the property of secular lairds. 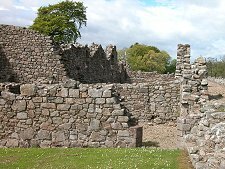 Deer Abbey ended up in the hands of the Fergusons of Pitfour. The abbey buildings were said to have remained structurally complete (if not in good repair) until 1809. 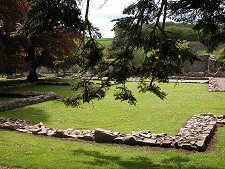 But then the Fergusons turned the site of the abbey into a walled garden, apparently recycling much of the stone from the abbey to build the substantial wall that still surrounds the ruins that remain. Then in 1854 Admiral Ferguson of Pitfour used much of what remained to build a family mausoleum where the east end of the abbey church had stood. 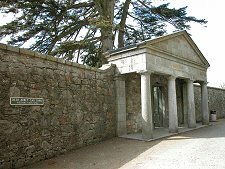 The mausoleum has since been removed, but a sense of what it might have been like is gained from the grand entrance portico facing the main road, moved here from its original location forming part of the mausoleum. 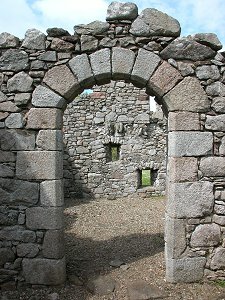 It seems reasonable to suppose that any stonework from the abbey that survived the building of the garden wall and the creation of the mausoleum was seen as fair game when material was needed for other developments on the Pitfour Estate, which lies to the north across the A950 from the abbey site. These included Pitfour House itself, demolished in 1927, an observatory designed primarily to watch over the neighbouring racecourse rather than the night sky, a canal linking the estate to the sea, a large loch built to give the excuse to build a large bridge, and on the loch's banks, the remarkably grand Temple of Theseus, a six-bay Greek Doric temple with 36 pillars and containing a pool said to have been home to Admiral Ferguson's pet alligators. 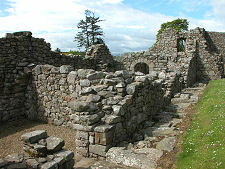 In 1926 what as left of the Abbey was purchased by the Catholic Diocese of Aberdeen, who placed it in state care in 1933. 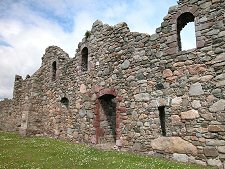 Today it is cared for by Historic Environment Scotland.